BUTTERWORTH: It has been a string of bad luck for jewellery shop owner Lim Kheng Lin. The 53-year-old has been robbed four times, the latest incident being on Tuesday. Lim’s daughter, who asked to be identified only as Ng, 24, could not believe the family’s misfortune. “Why does this keep happening to us?” she said outside the shop in Chai Leng Park yesterday. However, Lim is adamant about picking up the pieces and resuming her business after the shop is repaired. “I am sad and angry about what happened,” Lim said, adding that she had to continue working because her children were still young. Six years ago, burglars emptied Lim’s safe deposit box of cash and valuables amounting to about RM1mil at their home when the family was away on vacation. Several years before that incident, robbers struck twice at her other outlet in Raja Uda, escaping with hundreds of thousands worth of jewellery. 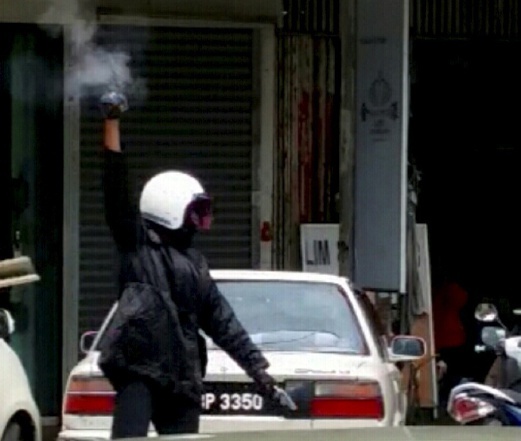 Lim said she and husband Ng Weng Keng, 53, were thinking about hiring an armed guard for better security at their shop. Penang Chief Minister Lim Guan Eng visited them and said the robbery was shocking because the state has one of the lowest crime rates in the country. He said Penang Chief Police Officer Comm Datuk Wira Abdul Rahim Hanafi would be assigning a special unit to the case. The police have also been asked to increase patrols in the area, he added. 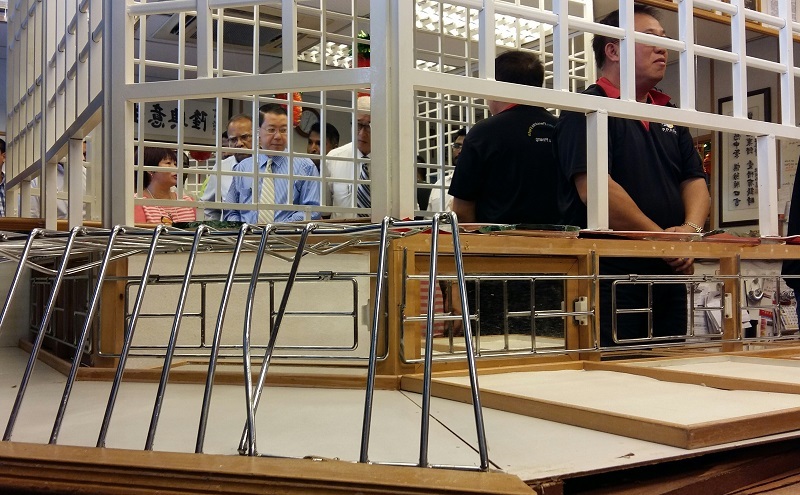 From left: Lim Kheng Lin (in orange) briefing Chief Minister Lim Guan Eng (in blue) about how the robbery at her families jewellery shop happened as he looks at the damaged display counter during his visit this morning. – The Malaysian Insider pic by Looi Sue-Chern, September 30, 2015. The Penang government today expressed shock and dismay at how a local jewellery shop in Prai, Penang, could be robbed in broad daylight yesterday. Chief Minister Lim Guan Eng said it was appalling how the robbery had happened right in front of a busy market in Taman Chai Leng. “It was shocking… the way they did it without fear, as if nothing could stop them. They behaved like gangsters in a movie. “It was not an ordinary crime. It showed complete contempt for the law. “Penang has one of the lowest crime rates nationwide and we are concerned,” he told reporters when visiting the jewellery shop this morning. Guan Eng said he had also spoken to Penang police chief Datuk Abdul Rahim Hanafi about the incident and was informed that the police would be setting up a special unit to track down the culprits. “He will do what is necessary to solve this case… we have to restore the people’s confidence in public safety,” he said, adding that he was also asking the police to increase patrols in the area. BUTTERWORTH: A daring jewellery shop robbery in Prai was caught on video. In the 11.30am incident, a bystander recorded the scene outside the shop at Chai Leng Park, where an accomplice stood outside the shop, holding up two guns. 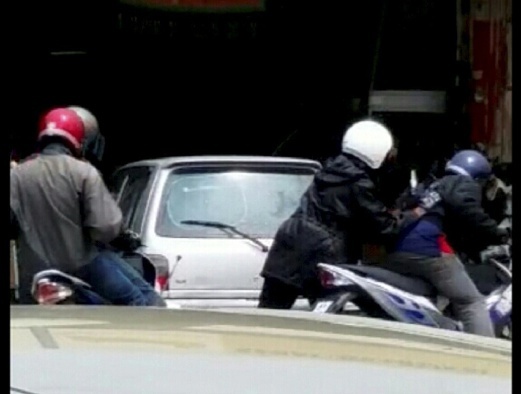 BUTTERWORTH: Four robbers clad in black jackets and face covered with helmet visors fled with trays of jewellery after robbing a jewellery shop in Jalan Medan Kurau 1 in Taman Chai Leng here. It is understood that the robbers had arrived in two motorcycles during the incident that occurred at about 12pm Tuesday. Three of them had dashed into the shop; two armed with sledgehammers. They smashed the glass panels to get to the loot while another armed with a pistol assisted inside. The remaining robber stood guard outside with two guns in his hands. This entry was posted in prai jewellers robbed, prai robbery caught on video and tagged prai robbery of jewellery shop. Bookmark the permalink.